Well, I'm officially in my third trimester. Just before we hit that milestone, the hubs and I decided to take a "Baby Moon". We kind of hate calling it that but, if it gives us an excuse to get away from our kiddos for a couple nights, we'll take it! (A million thanks to you, Gigi). We didn't go on any sort of baby moon before our first born for a few reasons. Now, looking back, I'm so glad we didn't. It's something that changes inside of you once you have a kiddo to look after. Before that first one comes along, there's a long list of things you take for granted (as do most couples, I'd assume). I know the list could go on and on... but, those were our favorite reasons to get away :) Plus, after not seeing our babies for a few nights, their hugs and kisses are just so much sweeter. After coming home to them completely refreshed, we were so happy to have them ruining all of our sleep, flexibility, communication, privacy and clarity. Without a doubt. So where'd we go?! Niagara Falls, Canada! With a day trip to Toronto! Our drive from Ohio to Canada started off with a little bit of a snow storm which made our drive a little slow, but the further North we headed, the better the weather turned out! Since it was such a beautiful day, we were able to take advantage of our newfound flexibility and pulled off at a National Park that we had seen signs for on the highway. 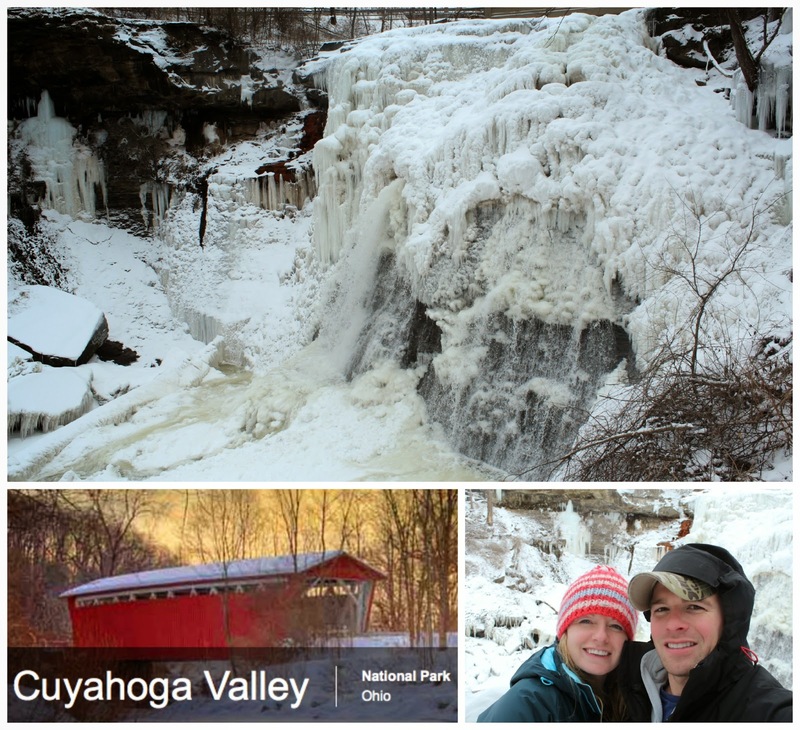 We only spent 30 minutes there, but we were able to take a short walk to see a waterfall completely frozen over. It was very beautiful but it was too chilly to really enjoy the scenery more than a few pictures worth. We were fortunate enough to be able to stay in the Hilton by Niagara Falls which gave us a beautiful view of both the American and Horseshoe Falls from our room. with Spiced Tomato Poached Chicken, Cheddar and Jalapeño Jack Cheese, Avocado Corn Salsa, Cilantro, Valentina Hot Sauce in a White Corn Tortilla. We also shared a bowl of freshly mashed guacamole with warm tortilla chips. We could have stayed there all day eating tacos and guac but we decided to try to sample more of the city so we bundled back up and headed to PJ O'Brien Irish Pub. 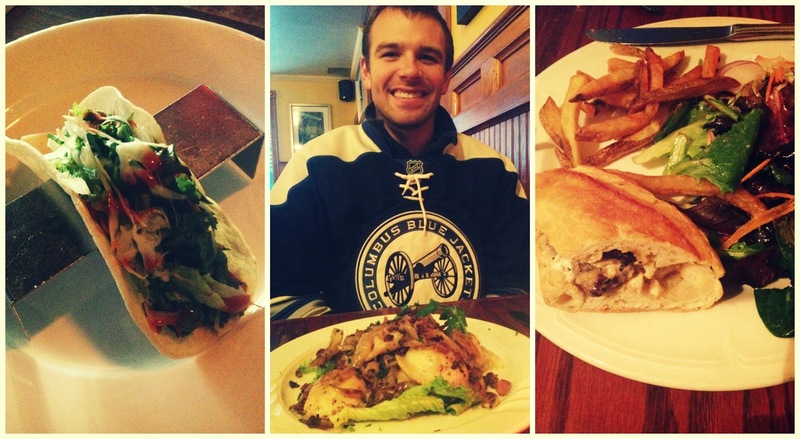 There, we found the BEST Pierogis (center picture, below) and we split a Steak Sandwich (far right picture, below). Of course, Bryan was able to indulge in a few local beers that he thoroughly enjoyed at each stop we made. After our food tour of Toronto, we finally made our way to the Air Canada Center where the Toronto Maple Leafs play. We were able to watch our home team, The Columbus Blue Jackets, win against Toronto (miraculously). We had so much fun!